A bizarre-looking aircraft was rolled out February 26th on a test at the Mojave Air & Space Port. 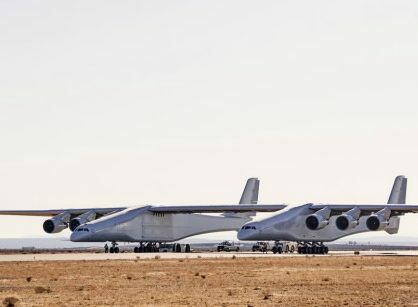 The Stratolaunch project is backed by billionaire co-founder of Microsoft, Paul Allen, and undertook some reasonably high-speed – but ground-based – tests. The tests were designed to ensure that the aircraft’s key flight-control surfaces were working nominally. The twin-hull aircraft, which measures 117 metres (385 ft) from wing-tip to wing-tip (and a Boeing 747 is a mere 68m wide) is designed to mainly carry satellites into low Earth orbit (LEO). When it flies (due in 2019) it will be the largest aircraft, by wingspan, ever to fly. The concept is straightforward. The aircraft is designed to operate from any suitable runway while carrying a rocket between the twin fuselages. The aircraft will fly to 35,000 ft (11,000m) where it will release its rocket and its satellite cargo. The project’s backers say that the overall costs, and speed of repeated launches, will be significantly lower than its conventional rocket launches of satellites.